• 18.4" HP Pavilion HDX18T Core 2 Duo 2.53GHz 4GB RAM 320 GB HDD and Blu-ray ROM Laptop for $949.99 plus free shipping (normally $1,199 - use coupon code NBZ2897). • 17.3" Dell Inspiron 17 Intel Dual-Core T4200 2GHz LED Laptop for $499.00 plus free shipping (normally $634). • 17" HP G70-460US Core 2 Duo 3GB RAM 320GB HDD Laptop for $549.99 plus free shipping (normally $679). • 15.6" Dell Inspiron 15 Pentium Dual-core 2.0GHz 3GB SDRAM 320GB Laptop for $499 (normally $675). • 15.6″ Acer Aspire AS5536-5883 AMD Athlon X2 QL-64 Notebook for $449.99 plus free shipping (normally $599.99). • 15.4" Lenovo G530-444635U Dual Core 2GB DDR2, 160GB HDD Laptop for $319.99 plus free shipping (normally $427 - use coupon PAYPALBTS88). • 10.1" Gigabyte TouchNote T1028 Intel Atom N280 with 1GB RAM 160GB HDD 6-Cell LED-Backlit Touchscreen Tablet Netbook for $550.01 plus free shipping (normally $698.98 - use coupon code TechBargains$50GigabyteNet). • Dell Inspiron 537s Core 2 Duo Processor 2.80GHz 2GB SDRAM 320GB HDD Desktop with 24" LCD for $575 (normally $719 - use coupon code 2JP4Q4$ZRFLKFQ ). • MSI WIND PC Atom 1.6ghz system for $119.99 plus free shipping (normally $134.99). • 23" Dell S2309W Widescreen LCD Monitor for $148 plus free shipping (normally $239). • 22" Samsung 2243SWX Widescreen LCD Monitor (1920x1080) for $134.99 plus free shipping (normally $189 - use coupon code XTHR0RQRXJHQ12). • 20" Dell S2009W Widescreen Flat Panel Monitor for $109 plus free shipping (normally $150). • 19" Dell IN1910N Widescreen LCD Monitor for $99.00 plus free shipping (normally $129). • 2TB Western Digital Caviar Green WD20EADS 32MB 7200 RPM 3.5" Hard Drive for $179.99 plus free shipping (normally $230 – use coupon code XTHR0RQRXJHQ12). • 1.5TB Seagate 7200 RPM External Hard Drive for $139.99 plus free shipping (normally $199.99). • 500GB Iomega Prestige External Portable Hard Drive for $79.99 plus free shipping (normally $119.99). • Netgear Wireless-N USB Adapter (Recertified) for $10 plus free shipping (normally $58 - use coupon code EMCLVMV69). • Saitek PZ30AU Eclipse Keyboard for $34.99 plus free shipping (normally $49.99). • Kensington Ci70 Slim Keyboard for $15 plus free shipping (normally $64). • Razer Barracuda HP-1 Gaming Headset for $54.99 plus free shipping (normally $129.99). • iGo Universal AC/DC Power Adapter for $14.99 (normally $30). • Microsoft Xbox 360 Elite Gaming Console (Refurbished) with 120GB Hard Drive for $199.99 plus free shipping (normally $399.99 - use coupon code XDEALS). • Microsoft Xbox 360 Pro 60GB Console (Open Box) for $199.99 (normally $255). • Microsoft Xbox 360 Pro 20GB Console (Refurbished) for $158.99 (normally $249.99). • King of Fighters XII on Xbox360 or PS3 for $52.90 (normally $59.99). • Call of Juarez: Bound in Blood on Xbox 360 for $49.90 (normally $59.99). • G.I. Joe: The Rise of Cobra on Xbox 360 or PS3 for $44.90 (normally $59.99). • Conan on Xbox 360 with Xbox 360 wireless controller for $31.90 (normally $39.99). • Grand Theft Auto 4 on Xbox 360 or PS3 for $29.98 plus free Shipping (normally $39.99 - valid today only). • Stormrise on Xbox 360 for $9.90 (normally $29.99). • Xbox 360 Wireless Controller for $22.90 (normally $39.99). • PlayStation 3 80GB Console with Bonus Games & Movie for $399.00 (normally $499.99). • Red Faction: Guerrilla on PS3 for $44.90 (normally $59.99). • UFC 2009 Undisputed Imported Version on PS3 for $41.90 (normally $59.99). • Guitar Hero World Tour Complete Bundle on Xbox 360, PS3, Wii, or PS2 for $122.43(Xbox 360) $128.87(PS3/Wii) 115.23(PS2) plus free shipping (normally $169.99). • Nintendo Wii Family Fun Bundle with Bonus Game for $359 (normally $389). • New Super Mario Bros. on Wii for $46.99 plus free shipping (normally $49.99). • Animal Crossing on Wii with Wii Speak for $34.99 plus free shipping (normally $59.99). • Game Party on Wii for $9.99 plus free shipping (normally $19.99). • Street Fighter IV Bundle on PC with Madcatz Fightpad for $59.90 (normally $69.99). • Call of Duty: Modern Warfare 2 on PC with Bonus $10 eGift Card for $49.82 (normally $59.99). • Call of Juarez: Bound in Blood on PC for $31.90 (normally $49.99). • Mirror's Edge on PC for $5.90 (normally $19.99). • MySims on PC for $5.90 (normally $39.99). • Red Faction 2 Imported Version on PC for $5.90 (normally $19.99). • SONY has a bunch of PSN Games Marked Down including WipEout HD and PixelJunk Eden! • GameStop has Buy 2 Used Games Get 1 Free Deals going on! • GoGamer Madness Sale! Slashed prices on many hot games! • 52″ Sharp LCC5255U Aquos LCD HDTV for $1,199.99 (normally $1,599.99). • 47" LG 47LH55 240Hz, 1080p LCD HDTV for $1,374 plus free shipping (normally $1,699.99 - use coupon code AFLLGE1374). • 40" Sony Bravia KDL40V5100 1080P 120HZ LCD HDTV for $818 plus free shipping (normally $939). • 40" Toshiba 40RV525U 1080p LCD TV for $648 plus free shipping (normally $780). • 19" Vizio VA19L 720p LCD TV for $199 plus free shipping (normally $238). • Samsung HT-BD120 Blu-ray Home Theater System for $549.99 plus free shipping (normally $649.99). 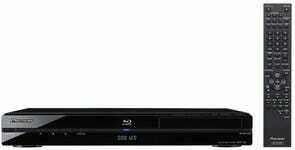 • Pioneer BDP-120 1080p Blu-ray Disc Player for $216.77 plus free shipping (normally $249.99). • Klipsch WB-14 Espresso Icon W Bookshelf Speakers (2-set) for $347 plus free shipping (normally $599 - use coupon code AFLKLP347). • John Adams on Blu-ray for $45 plus free shipping (normally $79.98). • Blade Runner Five-Disc Collector's Edition on Blu-ray for $18.99 or DVD (Briefcase Packaging) for $37.49 plus free shipping (normally $39.99/Blu-ray or $78.92/DVD - valid today only). • Casino Royale on Blu-ray for $13 plus free shipping (normally $18). • Ghostbusters on Blu-ray for $9.99 (normally $28.95). • Planet Earth: The Complete BBC Series on HDDVD for $18.49 (normally $99.98). • "Abnormally Attracted to Sin" by Tori Amos MP3 album download for $2.99 (normally $8.99 - valid today only). • 16GB Sony X Series Walkman OLED MP3 Video Player for $255 plus free shipping (normally $300 - use coupon code 65G7RQ11J?M2LH). • 60-Minutes Flip Video Green Ultra Series Camcorder for $99.99 plus free shipping (normally $149.99). • 3.5" Motorola MOTONAV TN20 Portable GPS Navigator with Text-to-Speech for $99.99 plus free shipping (normally $179.99). • HTC Snap S511 for $99.99 (normally $599.99). • Samsung Exclaim M550 for $49.99 (normally $299.99). • LG Rumor 2 for $0.01 (normally $279.99). • Exchange Online 2009 (Company Name) t-shirt for $0. • Gift at Coach Stores for $0. • Playtex Sport at WalMart for $0. • Ambi Soft & Even Stretch Mark Diminishing Oil, Colgate Wisp for $0. • Set of Tavern on the Green Recipe Cards for $0. • Mars Chocolate for $0 (250,000 per Friday). • 20-Piece Nicorette Starter Pack Gum for $0. • "Dreams-Come-True-Girl" by Cass McCombs featuring Karen Black MP3 download for $0. • HangTime on iPhone for $0.